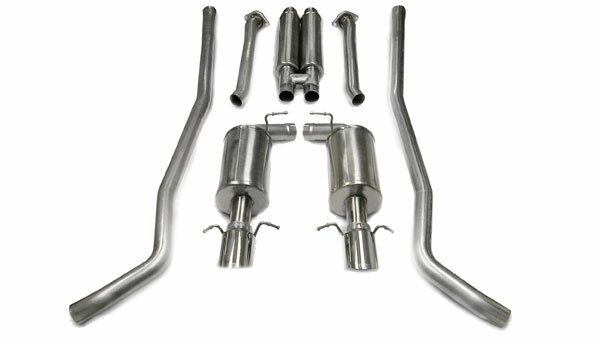 Corsa Performance 14155 - Corsa Dual Exhaust 2.5 Rear Exit CTS-V; 2004-2006. Install a CORSA Performance exhaust on your Cadillac CTS-V, and get the sound you want and the power you need. Hit the gas and feel the power as it blends with the gutsy exhaust note. Let up and notice how quiet this exhaust is when cruising or idling. From the 100% stainless steel tips to the patented Reflective Sound Cancellation technology eliminating annoying cabin resonance, a CORSA exhaust gives you improved performance, quality and engineering, in concert with power. 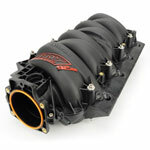 Straight-through, 2.5 nonrestrictive design specifically tuned for the Cadillac CTS-V, increases exhaust flow. Flow bench-tested 17.8% gain in exhaust flow vs. stock muffler. Bold when you want it to be. Quiet when it needs to be. There is no drone with the CORSA exhaust system because the CORSA exhaust system uses RSC technology to eliminate problem frequencies that cause interior drone/resonance at cruising speeds. 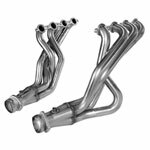 CORSA&apos;s Cadillac CTS-V exhaust system features a patented non-restrictive Straight-through design reduces back pressure and frees up additional power resulting in improved horsepower and torque. As an additional bonus, your Cadillac CTS-V can result in greater fuel economy because of less back pressure and more power.